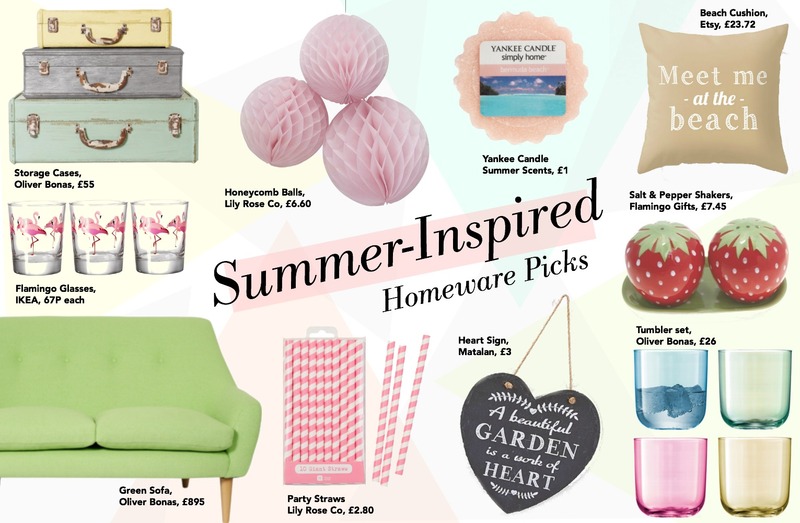 Recently I've been getting really into homeware, as I'm hoping to move soon, and with summer around the corner I thought it might be a nice idea to show you some of my 'summer inspired homeware picks'. For me, summers have always been about parties and BBQs with friends, so I've included some party pieces and some cute cutlery and glasses perfect for those occasions. Living in the UK, a fond summer memory I have from my childhood is strawberry picking. Every summer we used to go to our local strawberry fields to pick (and eat) the biggest ones ready to eat with some cream in the garden when we got home, and these adorable little strawberry salt and pepper shakers reminded me of just that - so I had to include them really! What do you think of my summer inspired picks? I really loved creating this kind of wish list style post, so if you'd like to see more (I'm thinking of maybe doing a fashion or pastel inspired one) then please let me know in the comments below! This is so pretty Becky and I love the design of the wish list. With me planning on getting my own place soon I've been in love with finding new home ware things as well and want this kind of style too.